It's time again for the annual Ansible community review. Time flies. Our upward trajectory generally continued from 2014 and 2015 through 2016, and our growth continued to bring new challenges and new opportunities. Let's start again, as we do every year, with a look at the numbers. Debian’s Popularity Contest is an opt-in way for Debian users to share information about the software they’re running on their systems. 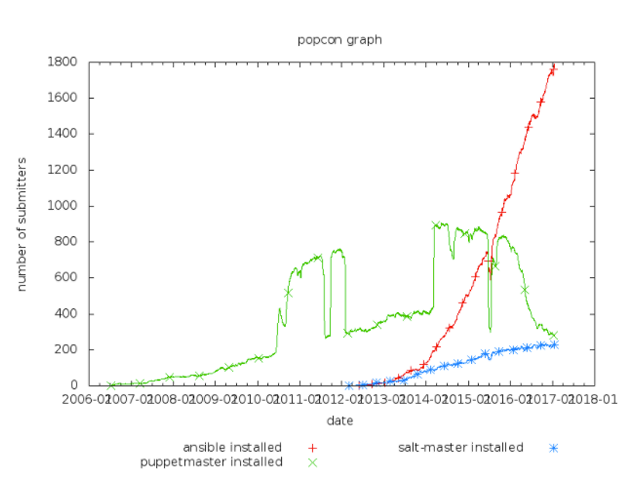 We see that Ansible has continued its steady growth through the end of 2016, nearly doubling its Popcon install base again in 2016. 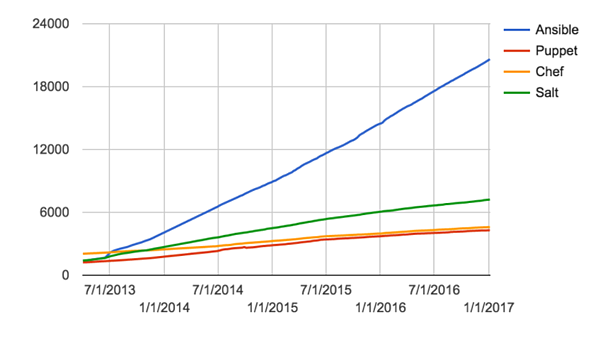 Ansible continued in 2016 to extend its already significant lead in GitHub Stars over other tools in the configuration management space, passing the 20k mark in December 2016. 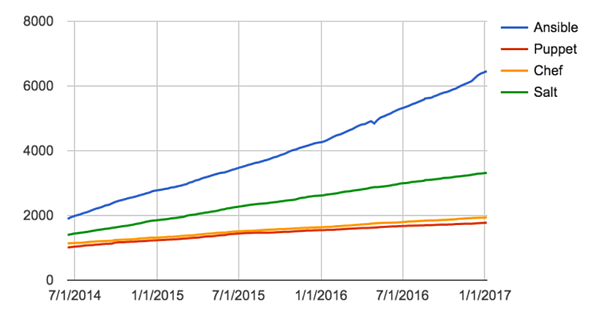 We see that in late 2016, the contributor numbers for Ansible took a pretty significant leap, putting it well above other configuration management projects. This was a result of merging Ansible modules back into the core project. Note that GitHub doesn't offer "number of contributors" as a searchable term - but there are 26 Python project on GitHub with 10k stars or more, and Ansible has the most contributors of all of them. Which means we believe it's quite likely that Ansible has more contributors than any Python project on Github. We view this as a key statistic because each fork represents a potential contributor. 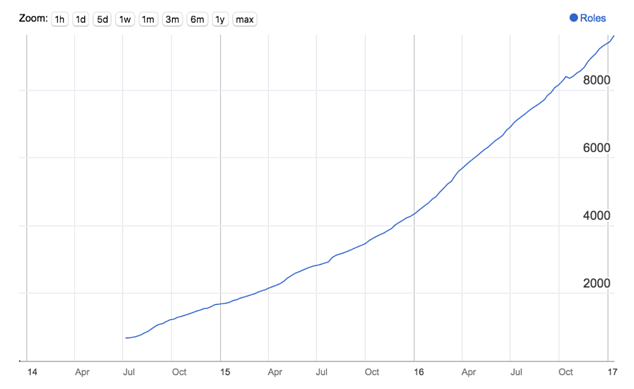 One of the most important challenges for any sizable open source project is to encourage new contributors, while keeping the quality of contributions high. With the module merge, our ratio of contributors to potential contributors climbed in 2016 from 30% to 38%. We see Ryan Williams' Hacker News Hiring Trend as a key leading indicator of hiring trends across the broader industry, and we track it closely. 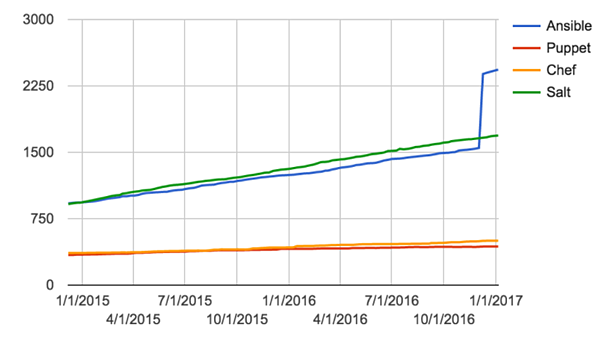 Over the last three months of of 2016, we saw more requests for Ansible skills on Hacker News than for any of the other configuration management tools combined. Ansible Galaxy is our service for allowing users to share Ansible roles. Galaxy was launched in early 2014, and it's now a critical part of the Ansible ecosystem. At the beginning of 2016, users had contributed just over 4000 roles. By the end of 2016, there were more than twice that many. Sometime in January 2017 we will surpass 10,000 Ansible roles available on the Galaxy site. Ansible meetups continue to grow around the world. At the beginning of 2016, there over 150 Ansible meetups around the world with about 24,000 members; now there are more than 200 meetups, with over 48,000 members. We will continue to help the growth and development Ansible meetups all around the world in 2017. If you would like to start a meetup of your own, we would be happy to help. 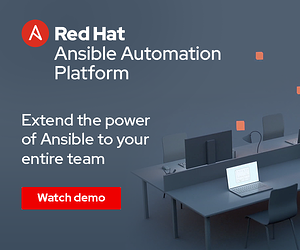 In order to help make it easier for Ansible users to build and deploy containers, we created the Ansible Container project in April; now users have the option to use pure Ansible to build and deploy containers, across their organization, from laptop to CI to production. 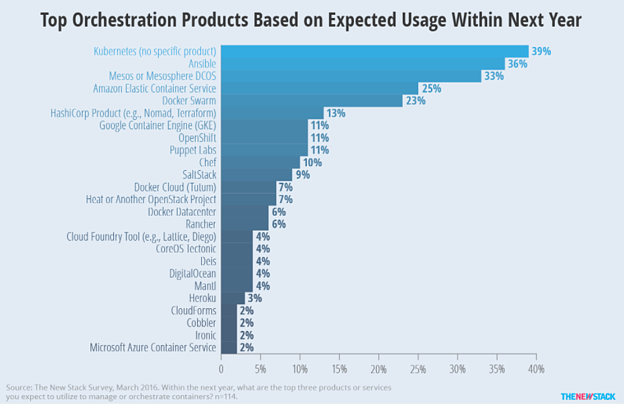 Read more about Ansible Container here. 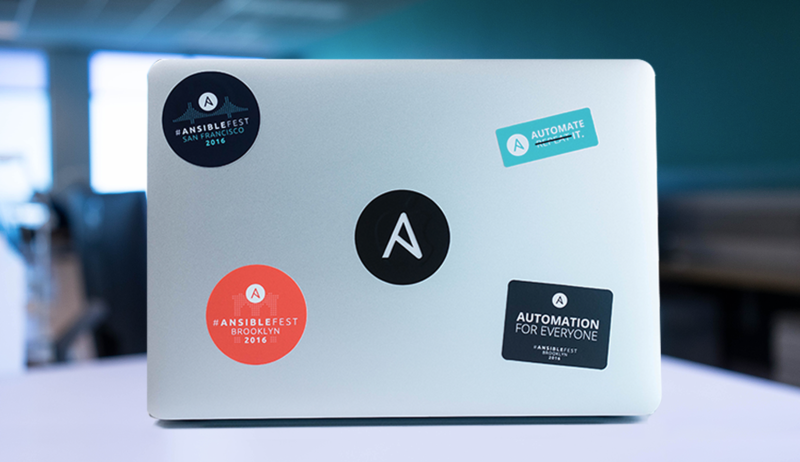 2016 was another great year for the Ansible community. We continue to strive to put the needs of our users and contributors first, and they helped us continue to grow in 2016. We look forward to another great year in 2017. Greg DeKoenigsberg Greg is the Director of Ansible Community with Red Hat, where he leads the project's relationship with the broader open source community. 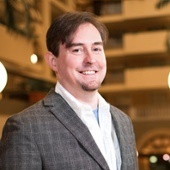 Greg has over a decade of open source advocacy and community leadership with projects like Fedora and One Laptop Per Child, and on the executive teams of Red Hat Ansible and of open source cloud pioneers Eucalyptus Systems. Greg lives in Durham NC and is on twitter at @gregdek.